Strangely, the weather turned cool today, the eve of Dragon Boat Festival. So, with all my new 'Earth and Fire' accessories, I felt like cooked puerh to warm up and relax. 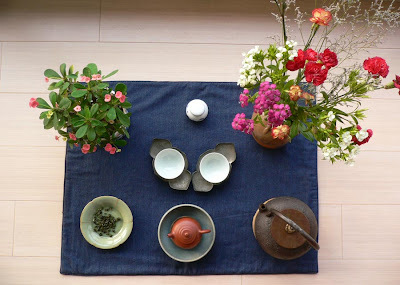 I flaked some of my 1990 wild Tuo Cha and set up this Cha Xi. At first (right), I used 3 similar cups with stand. 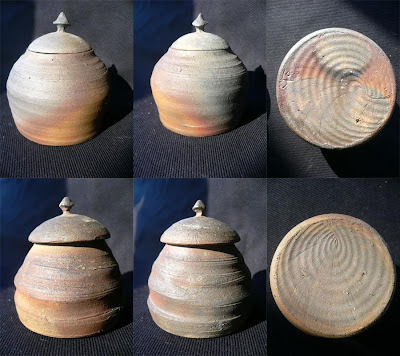 Then (above), I replaced two with my qingbai 'singing' cup (up) and a 7 days fired cup (right) to compare. 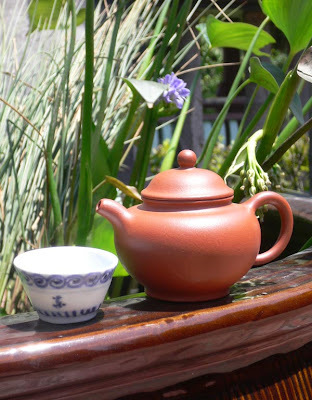 The earthware teapot softened this puerh further, as if it had aged several more years. 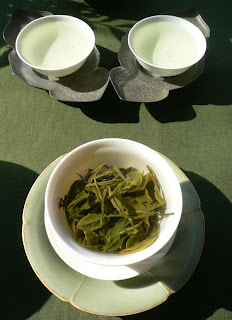 With the thin glazed qingbai cup, it felt mellow, but also very light in taste. 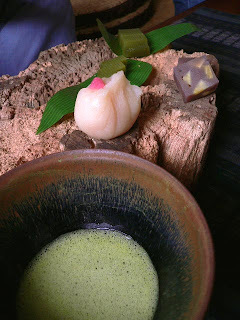 This was very nice, but somehow unexpected given the earthy cooked puerh fragrances. It's a little like a 'Susan Boyle' experience: the looks don't fit the voice or, here, the taste doesn't fit the fragrance. It's a wonderful and refreshing experience to feel fooled by your instincts! With the original cup (left), again, the double action of the teapot and the porous cup proved too strong for the tea and it tasted too weak. (Best to use with a glazed tea vessel and/or a rougher tea). 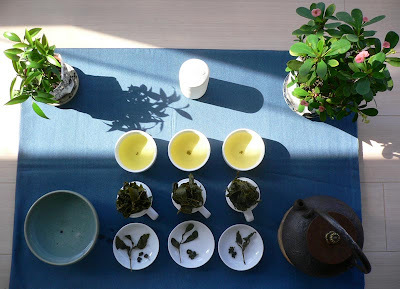 The 7 days fired cup added depth to the taste and gave the most harmonious result. Tomorrow noon, I hope to fetch some 'noon water' from the mountain of Shan Lin Shi! I'll take off for a few days and will return early next week. I wish you all a nice Dragon Boat Festival! Récolte du 11 avril 2009. 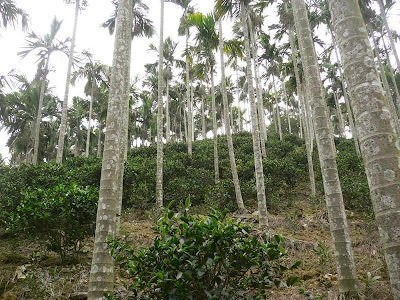 Lieu: la forêt montagneuse de Wenshan, près de Pinglin. Process: oxydation un peu plus forte (et traditionnelle) que pour la plupart des Baozhongs modernes (qui sont du type 'fleur de lys'). Il provient du même endroit que celui de l'an dernier, celui de 2007 et même celui de 2006! Je vais donc tenter d'éviter les redites. 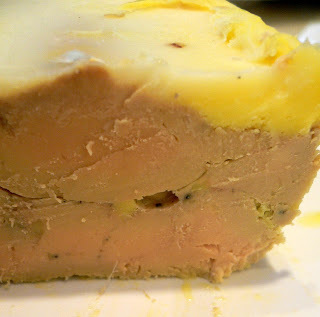 C'est aussi une raison pour laquelle je ne vous présente pas de dégustation en mode 'test', mais un Cha Xi, mode plaisir! Néanmoins, j'utilise ma théière en argent -pure à 99.5%- et celle-ci monte très haut en température. Seules les meilleures feuilles supportent une infusion si chaude sans rendre le thé astringent ou amer. Or, ce 'cru' 2009 est particulièrement moelleux et le reste même dans ces conditions extrêmes. Il ne faut donc pas hésiter à l'infuser longtemps et ne pas utiliser trop de feuilles. Ainsi, il sera encore plus long en bouche. Les feuilles ont été triées pour retirer les tiges. La récolte, plus précoce cette année, a permis d'avoir de nombreuses petites feuilles dont les odeurs sont plus fines. 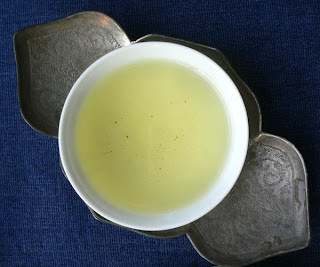 La couleur de l'infusion tire sur le jaune (normal, vu l'oxydation), même si ce n'est pas évident avec les coupes chantantes qingbai. Ce Cha Bu représente des poissons (symbole d'abondance en Chine). Kim, un ami expert de cérémonie de thé japonais, m'a raconté la légende de ce dessin: il s'agit d'une carpe qui voulait devenir un dragon. C'est pourquoi, il nage à contre-courant et saute hors de l'eau, par-dessus une cascade. C'est à ce moment que la carpe se transforme alors en dragon! Telle est aussi la vitalité et la force que je sens en buvant ces feuilles de Wu-Long, noir dargon! Ce sont les odeurs et toute l'énergie de la forêt de Wenshan dans ma coupe! 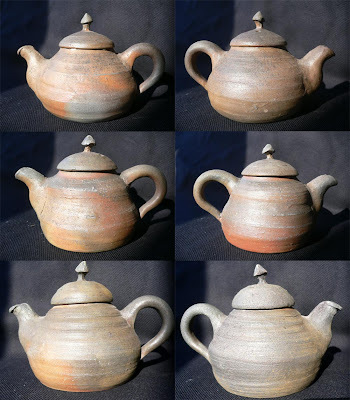 Besides these 3 teapots, my friend David Louveau has recently sent me some of his latest creations. His work remains very natural. The changes in color continue to come from the firing of his ware. 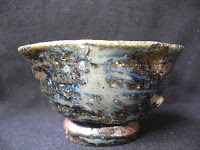 His previous bowls and cups had been fired for a week. 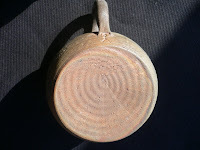 This time, the firing was reduced to 2 days and he used a special technique involving water to achieve these effects. The result on the above tea jars (8 cm and 7 cm high respectively) is a success. The warmth of the fire is clearly visible on these jars. 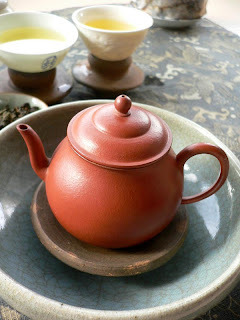 And with the porosity of this type of earth ware, they are very well suited to store cooked puerh. I also like the cups and their stand. 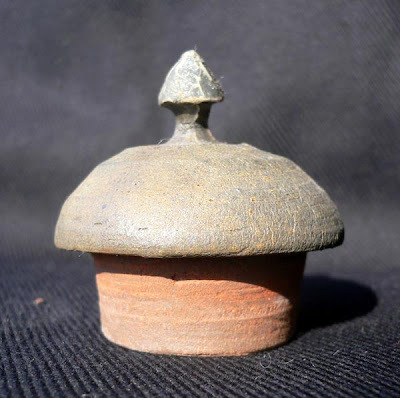 I have used these as Cha Tuos with my singing cups here. The size fits them nicely too. Compared to the week long firing, the shapes are much better preserved. The week long pieces look much more as if they had gone through hell and barely made it back! Here, it's more like a nice tan on the beach! 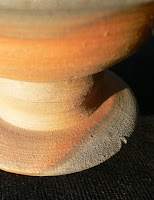 The shorter, the more control the potter has on the effects, but also the less 'natural' and unexpected the changes. Here we still have enough natural feel. On the other hand, with less wood and time consumed, the cost (and price) of these pieces can be reduced (roughly divided by 3). And what about the impact on the tea? The porosity of these pieces is great. 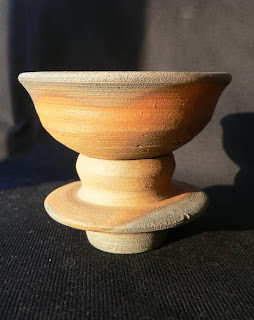 Thanks to the traditional firing and the use of natural clays (some as old as 40 years), these cups manage to filter the tea and change its taste greatly. It's like they are 'sucking' the taste out of the tea. (That's one reason cooked puerh or rough raw puerh is a good fit). Astringency and bitterness are greatly reduced. It's even enough to use just an earth ware cup or teapot instead of both together. The tea felt much smoother, rounder than brewed and drunk from a porcelain cup. 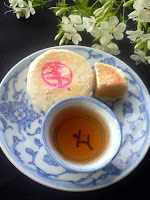 (Tests with my 2000 CNNP cooked puerh and a Menghai 'high mountain' cooked puerh of 2008). How do they compare to the cups fired for 7 days? 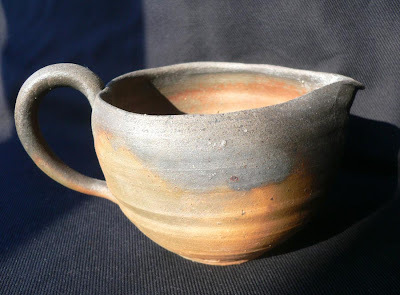 First, I felt that the longer fired cups handled heat better: they remained warm longer. Second, the taste was full, more harmonious and had more depth. 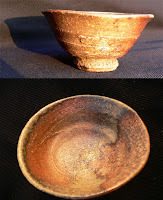 One of the differences is that the long firing produced natural glazing through the 'crystallization' of the many ashes falling on the cup. However, this natural glazing is only partial and still allows for filtering. 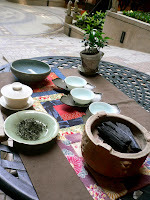 Still, it's already great to experience the positive impact on cooked puerh with these wares. 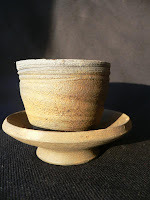 It's nice to confirm that the traditional wood firing isn't just about aesthetics and how different firings impact the tea. These wares are a real pleasure for the eye, bringing back to a time of folk art where every piece was unique and an expression of the culture of its time. 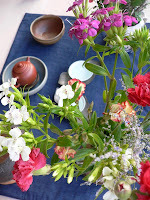 Thank you, David, for the Fire that lights your passion for pottery and ours for tea. 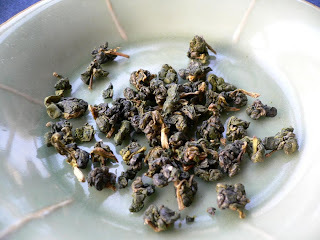 Luanze (qingxin) Oolong from Ali Shan (1200 meters elevation). Hand harvested on April 5, 2009. 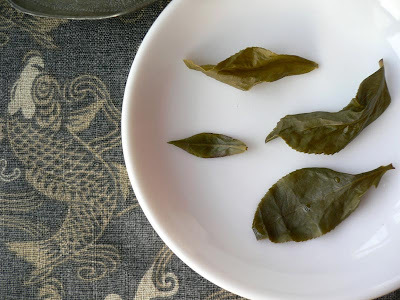 Hung Shui process: slightly higher oxidation and medium roasting. 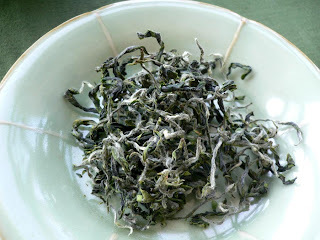 The most famous Hung Shui Oolong comes traditionally from Dong Ding. 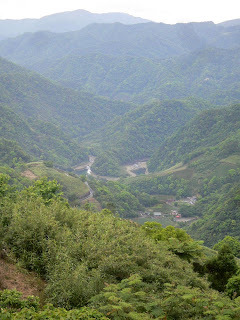 However, it is an open secret that the winners of Lugu's Dong Ding competition in recent years come from High Mountain plantations. The higher altitude creates better conditions for the leaves (warm day, moisture from mountain mist and cool nights...). 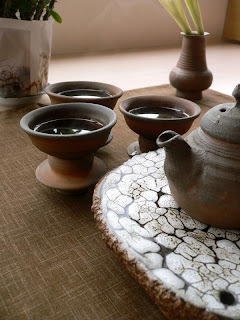 Therefore, a Gao Shan (high mountain) Hung Shui Oolong is something special that often aims for excellence. 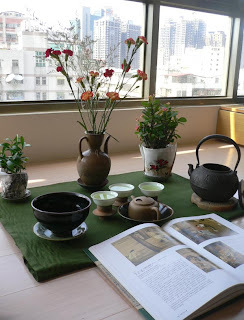 What is a good Hung Shui Oolong? It is like a good bottle of a grand cru classé from Bordeaux. You can enjoy it young, but you can also let it age many, many years. 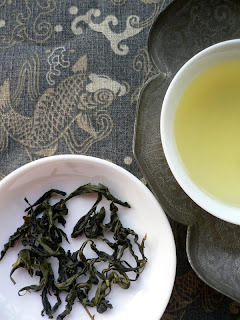 Hung Shui Oolong strikes the right balance between freshness and mellowness, between oxidation and roasting. Like when cooking a fish (or a juicy steak), it's important to find this balance and not overcook it. You'll notice different colors depending on the cup I use.The tea still looks green in the qingbai cup, but golden in the ivory cups. This is a sign of the right balance. What can I say about this tea? It is so soft and sweet! And yet, it brings liveliness to the tongue and a long aftertaste. It is very delicate and refined. But it isn't weak and manages to make even the seventh brew interesting. (I won't say more to let you discover this beauty by yourself). How best to brew it? The roasting is very recent and requires some adjustments to our brewing. 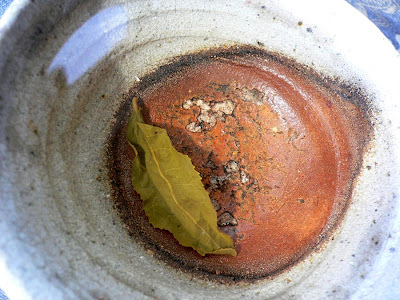 The challenge is to obtain a tea where the flavor of the roasting and the fresh leaves is well mixed and harmonious. The key adjustment is to pour the boiling water very slowly and carefully in the teapot and then let the leaves brew for a rather long time. The pouring out can then be done faster. Do this for each brew, including the first. 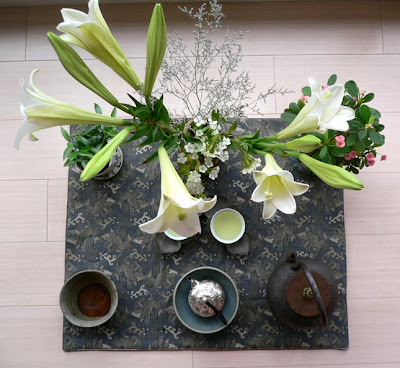 (Normal steps remain: preheating the teapot and cups, one layer of dry leaves on the bottom of the teapot). My seventh brew (2 hours) reminded me of Ai Jiao Oolong. And the open leaf found its original shape and almost its original color! Récolte du 10 avril à la main à Shan Lin Shi. (Gao Shan = haute montagne). J'avais présenté cet Oolong préparé comme en compétition. Cette fois-ci, je le prépare avec plus de 'gongfu', comme j'en avais eu envie à la suite de mes tests. 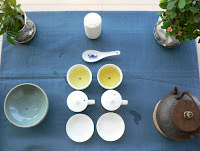 Mon Cha Xi se compose d'une théière Da Bing Ru Yi en zhuni, de coupes chantantes sur des Cha Tuo japonais anciens, un bol zafang Terre et Feu, une assiette bleue pour théière de Michel , un Cha Bu bleu foncé, une mini jarre peinte avec des lotus bleus, et des fleurs. Mes infusions restent relativement longues, car je n'utilise pas tant de feuilles et car celles-ci le supportent bien! 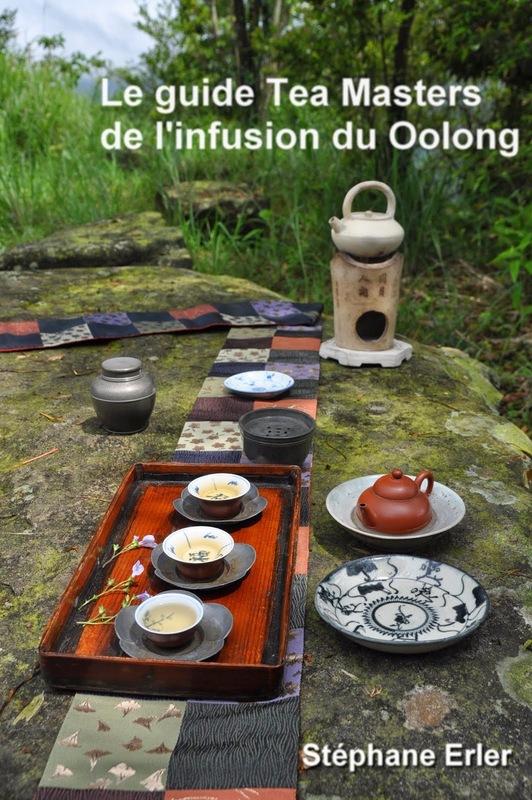 Mais le plus étonnant et merveilleux, d'après moi, c'est le goût soyeux de cet Oolong. Il commence très pur, comme invisible, puis laisse des picotements de vie sur la langue et un moelleux, une douceur gouleyante dans le fond de la gorge. On sent ensuite la richesse du terroir sur les papilles et la fraicheur des montagnes dans toute la bouche. Le reflexe est immédiat: je m'en ressers une coupe, puis une autre, et je repars pour une nouvelle infusion! Je suis impatient de lire comment vous l'avez apprécié. N'hésitez pas à laisser un commentaire. As summer approaches and temperatures rise, I felt like drinking my Bi Luo Chun. It was picked by hand in San Hsia on February 23, 2009, one of the very first harvests of this spring. 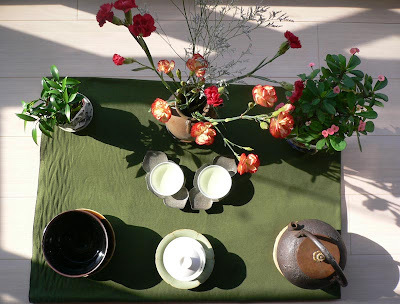 And for green tea, earlier means smaller and more tender buds, and lighter fragrances. This is especially true this early spring, with temperatures cold and little rain. The solution (Michael) isn't engineering, but it will require patience and skills: a Ming style Cha Xi featuring this Bi Luo Chun! Why Ming dynasty? 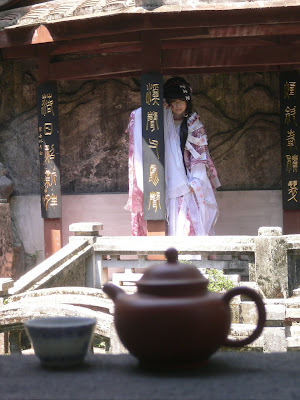 You'll find many reasons in the performance we did last year at the Taipei Story House. 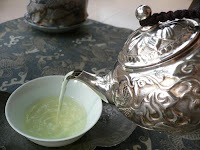 Ming scholars also drank loose green tea leaves to feel a connection to nature. This is why my Cha Bu is dark green and I display 2 plants and flowers. My cups are also light green. The Bi Luo Chun in San Hsia is made with the Qingxin Ganzhong cultivar. As Chiang Kai-shek fled to Taiwan in 1949 with around 2 million Chineses refuges, they couldn't purchase green tea from the Mainland ennemy. 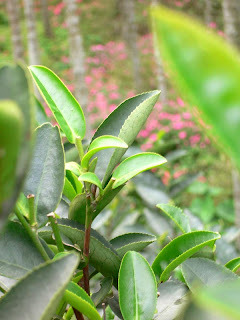 So, the green tea addicts encouraged the production of similar green teas in Taiwan. 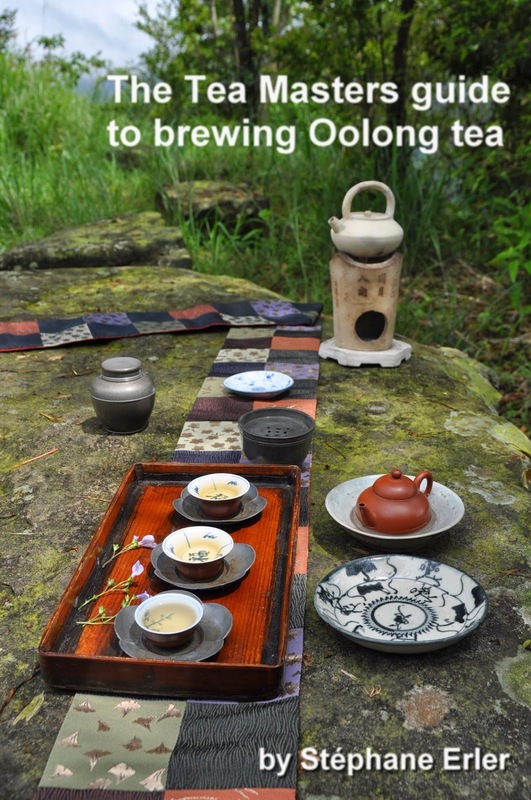 But because Taiwan has Oolong tea skills and culture, the San Hsia Bi Luo Chun is quite different than in China. In some aspects, while still a green tea, the farmers here make it somehow similar to Oolong. For instance, it can brew in just boiled water and its taste will remain quite sweet. The tea brew is very clear, transparent. The color is a light fresh, shiny green. The smell is fresh, small, barely open spring flowers (dandelion, magnolia). It tastes mellow with a hint of dryness. Cold sunny day. We made it! I feel cool again! "Voilà, c'est fini ce matin après avoir injecté plusieurs litres d'eau dans mon four, la dernière de cette série de cuissons a vraiment été à l'apogée de cette série. J'ai allongé le temps de cuisson 2 jours et 2 nuits ; la montée en temperature à été la même que les autres, mais ensuite l'embraisement du four à pris plus de 24 h ; la technique est de plonger progressivement les céramiques dans la braise (réduction par le carbone) jusqu'à ne plus pouvoir enfourner de bois dans le four et ensuite la sublimation de l'eau (hydrogene + oxygene) pour une réoxydation et je suppose que là aussi se produit une recrystalisation de la silice dans la terre qui la rend si particulière." Ci-contre, sur le pourtour de la base, on dirait comme un arc-en-ciel! (Cliquez sur la photo). Chaque pièce, selon sa position dans le four, a vécu l'aventure du feu différemment. Cela se traduit par des changements chromatiques uniques, variés. Et comme chaque théière est faite à la main, elles ont vraiment chacune leur personnalité. Aujourd'hui, j'ai testé mon puerh cuit de la CNNP de 2000 dans une de ces théières (comparé à l'infusion en zhong). C'est le puerh cuit le plus 'brut', puissant (et moins cher) de ma sélection, même s'il a déjà bien bénéficié de presque 9 ans pour s'affiner. En zhong, il subsite une astringence et un manque d'équilibre. Mais, infusé dans la théière poreuse de David, l'infusion est bien plus moelleuse, pratiquement sucrée (!) et les notes de tourbe et de terre ressortent particulièrement bien. La différence est impressionnante et bien plus marquée que pour une théière en zisha ou en duanni. On dirait que le puerh a pris encore 10 ans d'âge d'un coup! 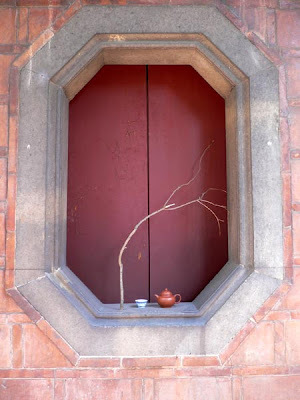 Ce mariage entre théière en potterie et puerh cuit (hei cha) est également conseillé par Teaparker dans son livre Cha Hu au chapitre 12. L'accord n'est pas que gustatif, mais esthétique aussi. La théière et le puerh nous ramènent tous deux vers la terre, la finesse au coeur du brut, l'humain qui surgit de la nature par l'apprivoisement du feu. (Merci David pour ce retour aux sources de la potterie). 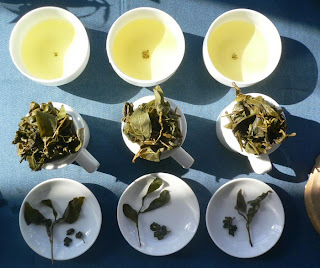 At first, I wanted to compare the late winter Shan Lin Shi Oolong (left) with the latest spring 2009 harvest (middle). But I found the comparison so interesting, that I added the summer 2008 Shan Lin Shi (on the right). 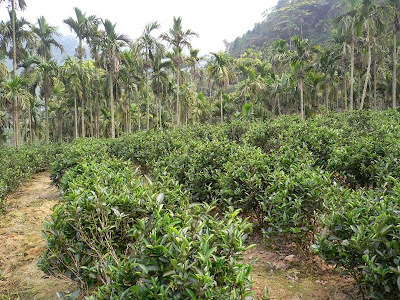 The spring 2009 Oolong was harvested on April 10, 2009 by hand. It is a Luanze (qingxin) Oolong cultivar, like the 2 other. I made the tests using 3 grams and 6 minutes infusions (twice). 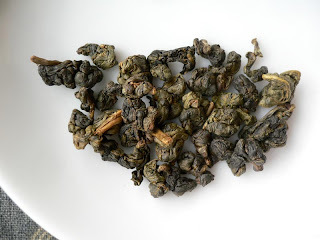 First observation: the brew of the late winter (Dong Pian) is the lightest. This lighter oxidation is also a good fit with the weather: it's colder in late November than in April. Second observation: the color of spring and summer is similar. This means that this spring's oxidation is slightly high. In terms of fragrance, it means more fruitiness than flowery fragrance. And in terms of taste, it should mean more mellowness. Third observation: (after tasting) Confirmation of my first 2 observations! 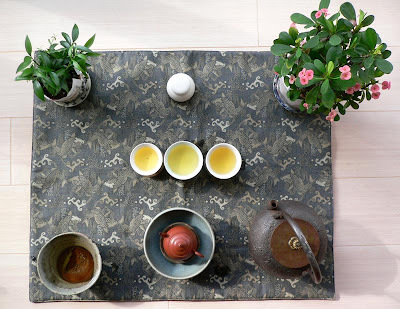 - The Dong Pian has more a pure floral character, but the fragrances are not exuberant as a spring Oolong. The taste is very light, mellow with a surprising long (and pleasant) lingering dryness. Freshness in the mouth. 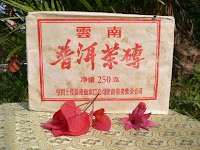 - The spring 2009 Shan Lin Shi has a just ripe, juicy papaya fragrance. The taste is rich, sweet and brings a touch of very light bitterness that plays in the mouth and unfolds a fruity aftertaste. What a pleasure to taste such an Oolong! 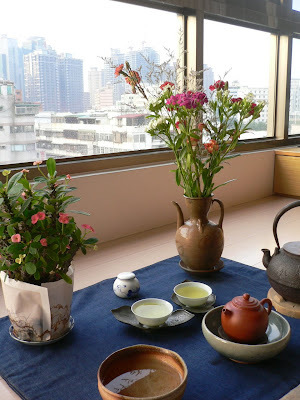 The sun, the moutain, the fruits of Taiwan, all are in this cup of tea. 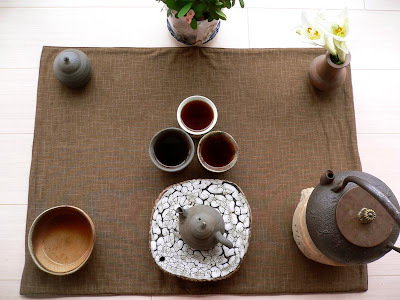 - The summer 2008 Oolong has stronger, very ripe fruity fragrances (peach) and some cereal smells. The taste is a mix of sweet and bitter (80/20 maybe) with more strength, but less refinement. Open the door, follow your heart! And along your way, a smiling tea fairy will appear! Le bonheur est dans le thé!